As stated in my plan I aimed to make for this challenge a pair of trousers, a skirt and a couple of tops. which just leaves the skirt. As I have previously stated I spend a lot of time in jeans so it seemed only appropriate that the skirt for this challenge should be a jean skirt. 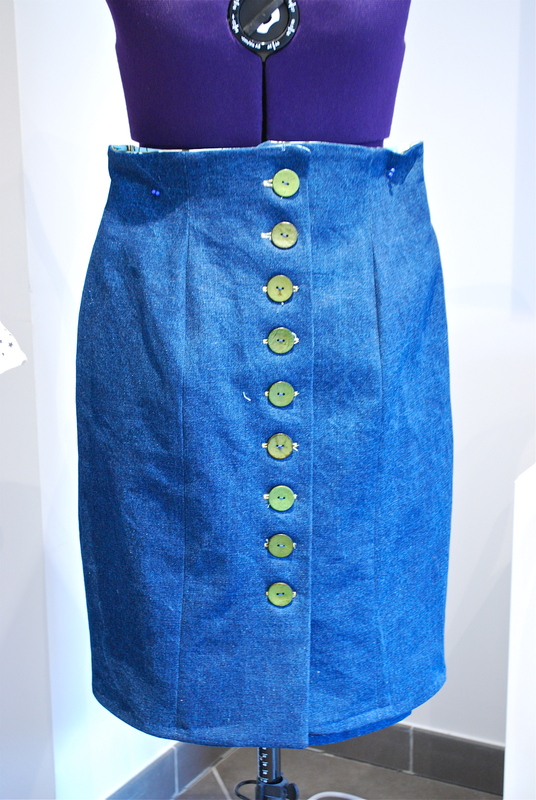 I have been hankering after a denim skirt for a while now and had originally planned to make something like the denim midi button through skirt at asos.com that you can see here. But, that kind of skirt needs a fabric that drapes and is generally lighter in weight than the denim fabric I had in the cupboard left over from my clover jean trousers so in the end I decided to play safe and stick to what I know and make up another Beignet. 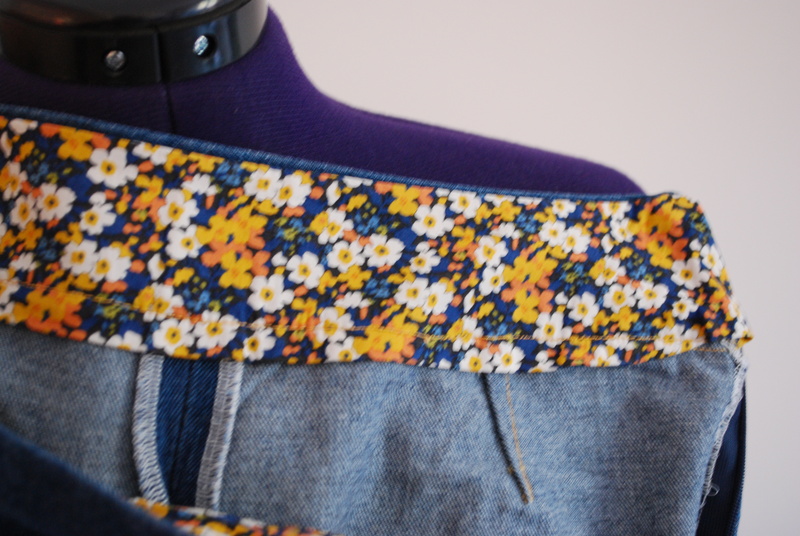 Given that the pink and purple versions (more to come on those soon) are somewhat in your face I thought that a darker denim version would be sufficiently different and, luckily, I had just enough fabric! As this was my third version of this skirt it made up fairly quickly. I decided not to line the skirt (which also helped the “speed sew”!) and instead of using the same denim fabric for the facings I used a fat quarter of a fairly heavy weight cotton that I had in the cupboard. 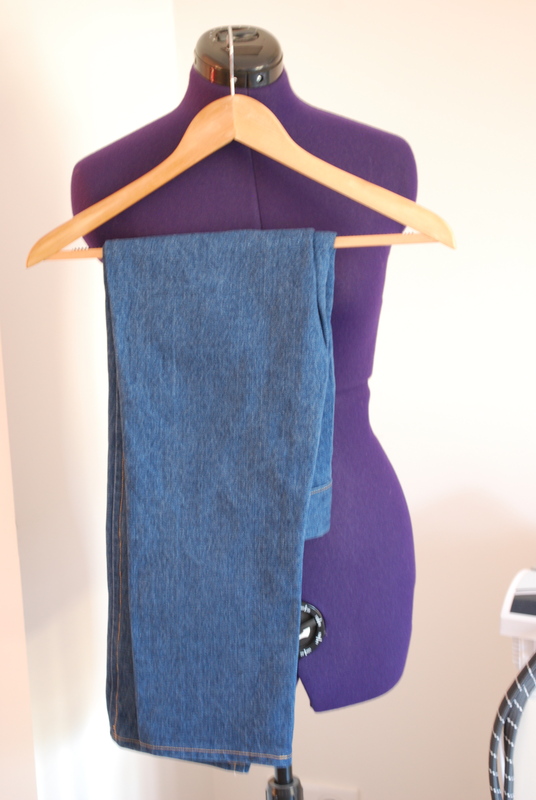 This helped the skirt to not have too much bulk around the waistline and at the bottom of the front sections. 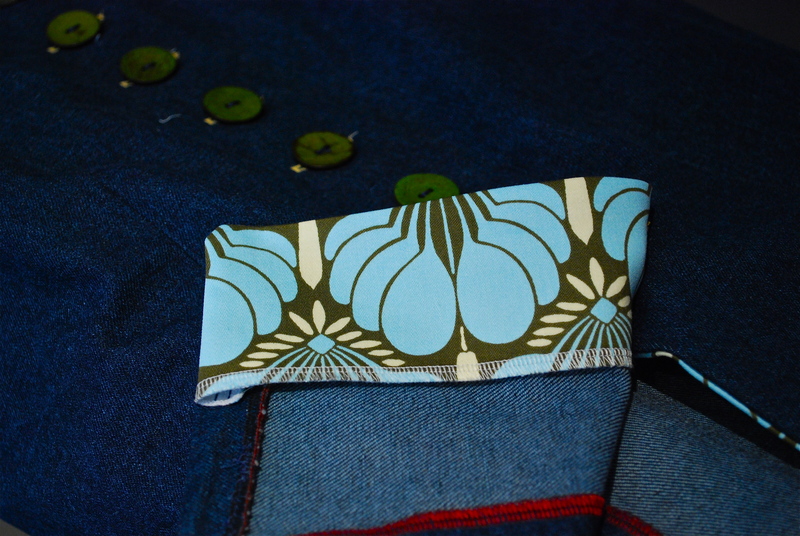 For the colour flash I opted for green buttons which I thought would go nicely with all three tops sewn recently. 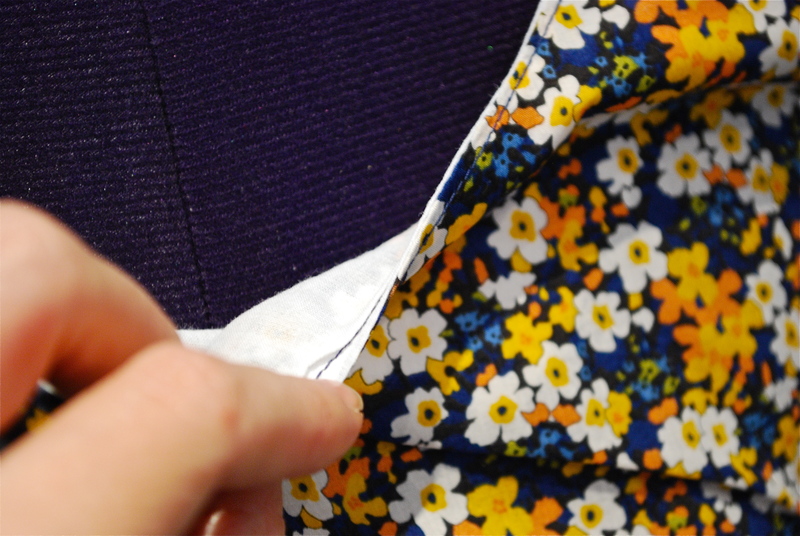 and I used yellow thread to sew the button holes. I haven’t yet decided whether I am going to add the belt loops that the pattern provides for. For the moment I like wearing the skirt with different belts and it seems to work just fine without the loops. Well, that completes the Late Fall Challenge. Three tops, a skirt and a pair of trousers. Now all that remains is to show you how they all fit together. Check back soon for the ‘lookbook’! 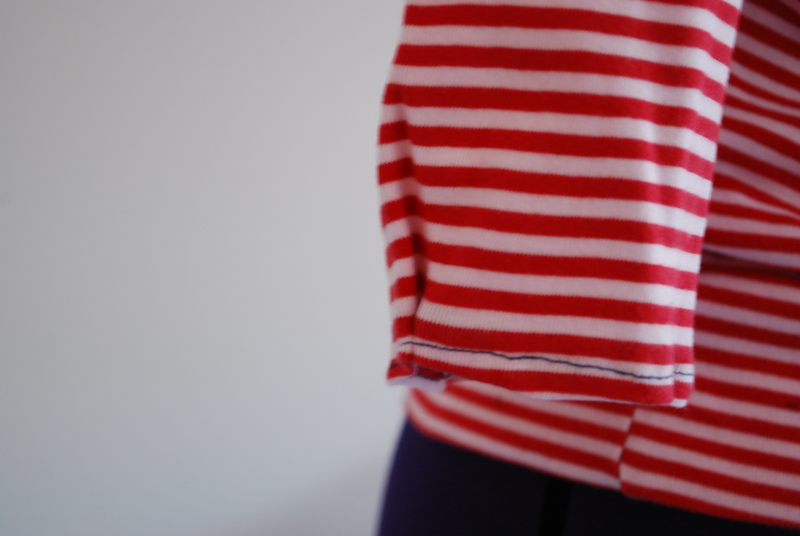 So with three items already done and a skirt on it’s way to completion I decided to add a quick and easy project – a jersey top. You may remember the red marinière I posted about here. 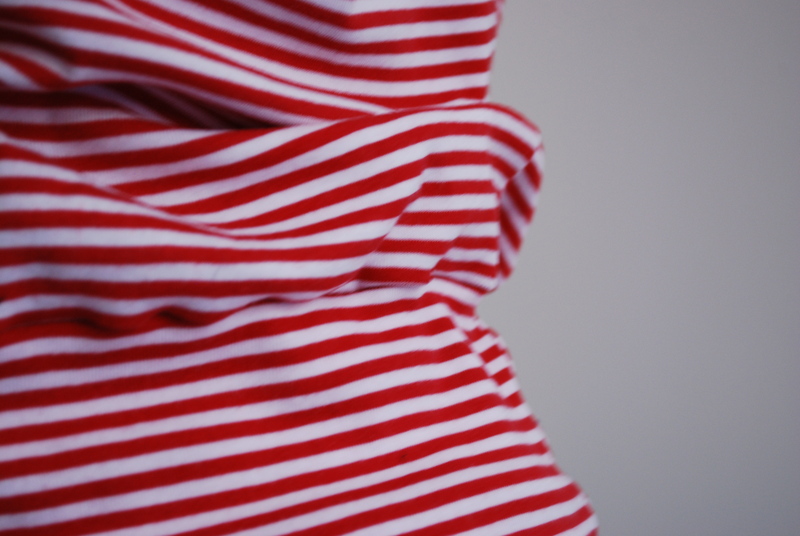 Well I still had some of the red and white stripe fabric left and decided to make it into a slightly different kind of top. 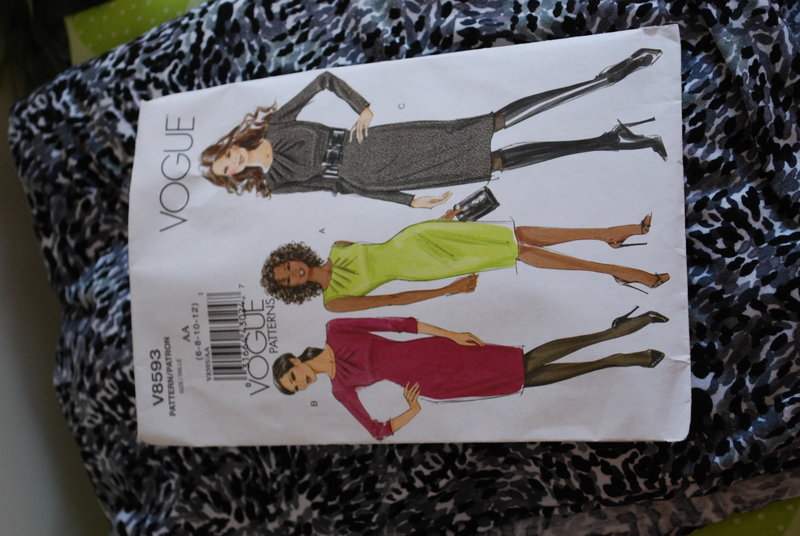 At first I thought I would go with a simple fitted top with gathered sleeves made from the bodice section of the dress pattern in Sew U Stretch but then I remembered this Vogue pattern I had bought a while a go to make a dress and decided to see if I could adapt it to make a top. The amount of fabric I had left meant that I had to go with the three quarter sleeved version but that suits me fine as you may have noticed from the other two tops that I sewn for this challenge that despite it being winter I still have a preference for short sleeved tops. It is not that it is not cold here it’s just that our heating works well (!) and often when I am busy , especially if cooking, I feel as though I am going to overheat. I therefore like to layer up rather than have one thick item of clothing on. I separated the bodice from the skirt on the pattern and cut out the bodice front and back and the three quarter sleeves. 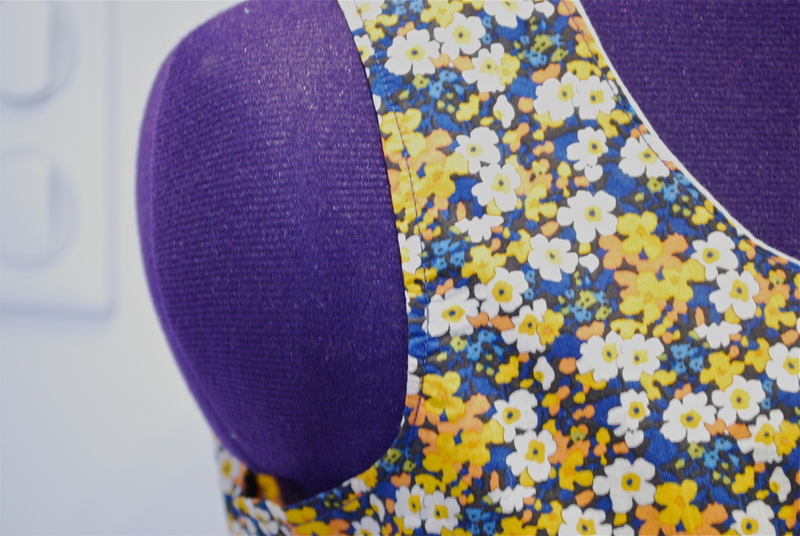 The pattern sleeve states that the dress should be made in moderate stretch knits only and has a zip closure on the centre back seam. As the red and white jersey that I was using is relatively stretchy, even for a jersey, I decided that I could skip the zipper as I was confident that I would be able to get the top on without any form of closure. I followed the instructions for the pleats on the front but in addition top stitched the pleats in place. 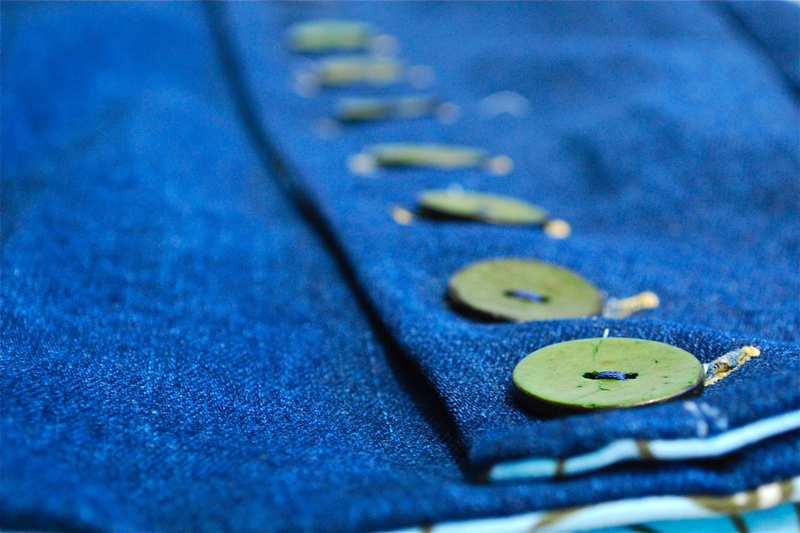 For the top stitching on the pleats and around the neckline and the sleeves hems I used a contrasting navy thread. 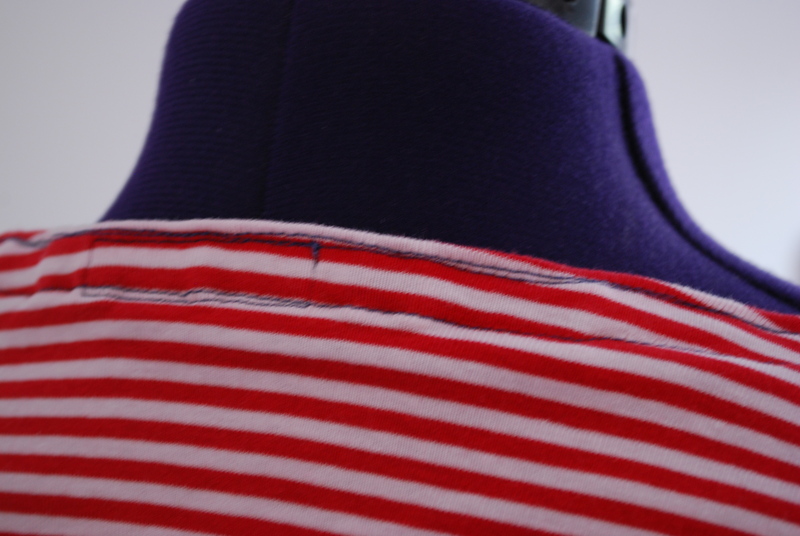 And I added a grosgrain ribbon on the inside of the back neck seam to prevent the neckline stretching out too much (along with the regulation label of course!) I also added a pleat tuck on each sleeve mainly because they were too wide but I think that the added pleat goes well with the overall design. And, finally I added a double band waistband which I find works well to stop jersey tops growing width-wise at the bottom and giving that gaping look which is never a good look! Put all that together and this is what you get: Basically a three quarter sleeve length t-shirt with a difference. 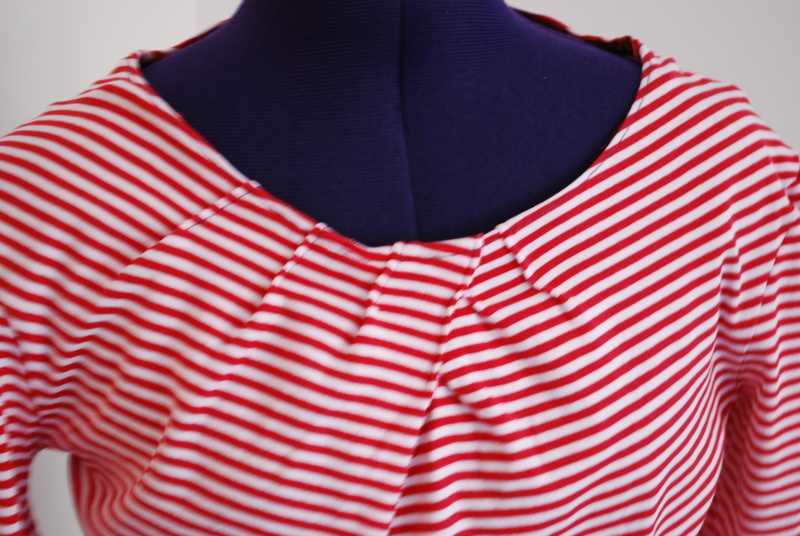 I like the pleats on this top and am looking forward to making the dress when I find some suitable fabric (I’m thinking a block colour to really show off the pleats with maybe an exposed metal zipper down the back…). 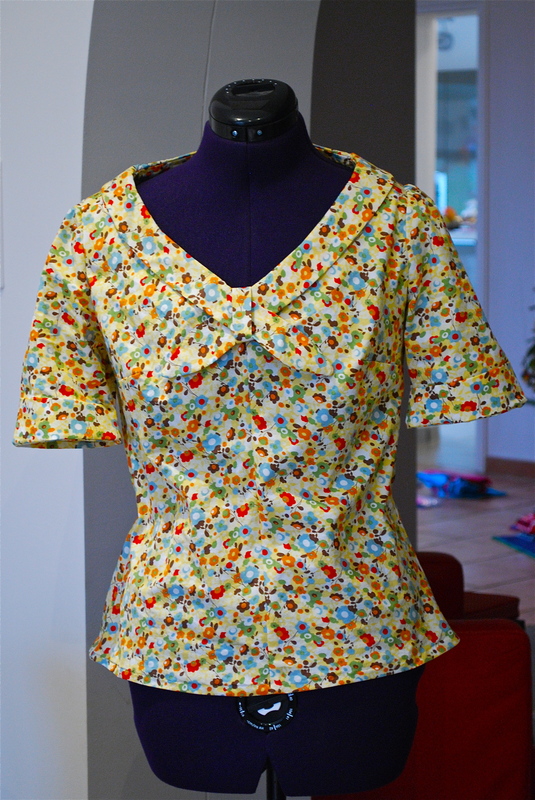 In the meantime I can see myself adapting this pattern again to make more tops. After sewing up the first two items, both tops, I thought it was time to tackle the trousers. 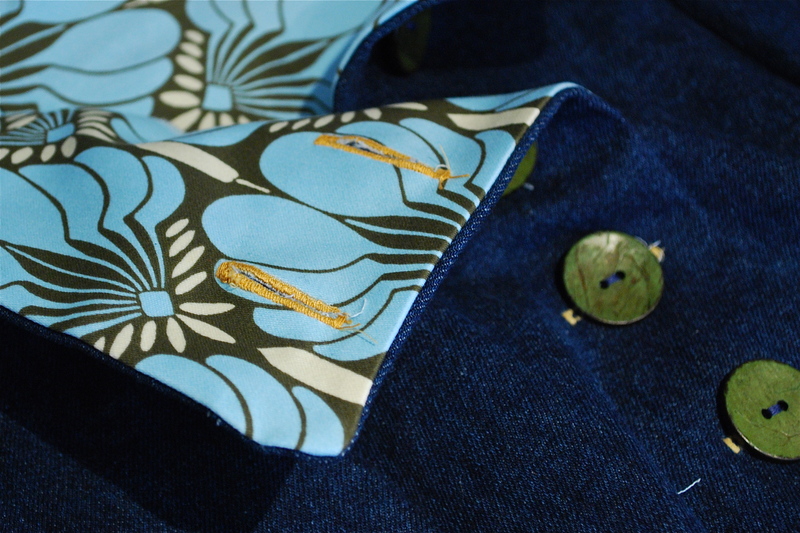 As stated previously I had decided to make up the Clover pattern from Colette Patterns in a blue denim. I spend a lot of time in jeans and my aim was to create a pair of trousers that could be worn like jeans (ie every day and for every occasion!) but were a little bit different. 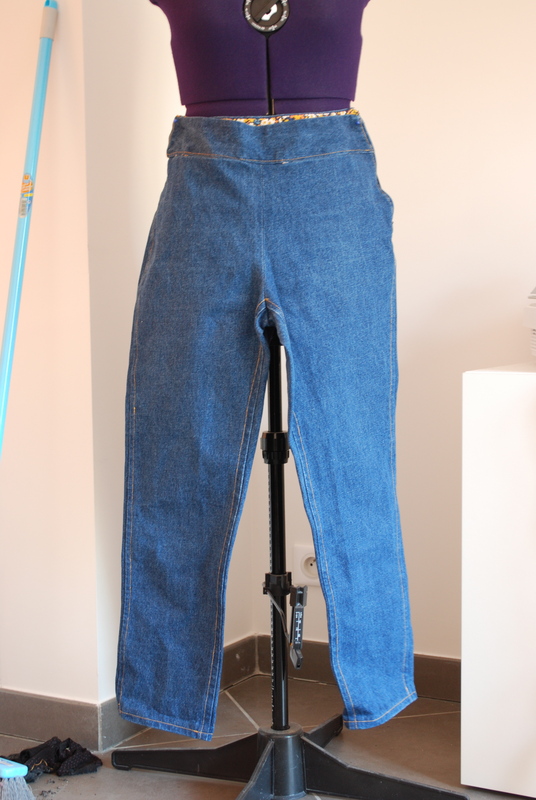 I made up version 1 of the trousers – ankle length and with pockets. Trousers have always seemed daunting to make but actually a lot of them, construction wise, are realtively easy to put together. There are not many pieces (often just a front leg and back leg and waistband) and most of the sewing is straight lines. The difficult bit is in getting the fit right. Something to do with the relationship between the crotch, hips and waist can make fitting trousers a nightmare – and that is before we even think about thigh circumference or inner leg measurements! 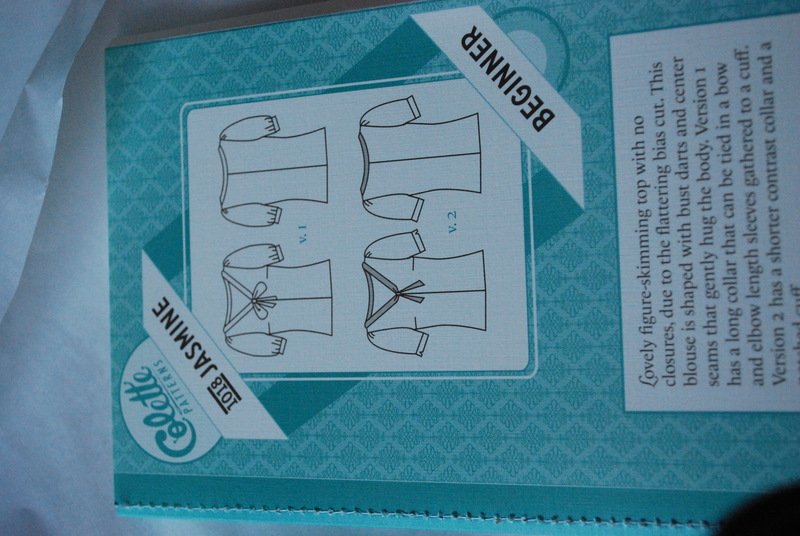 The Colette Patterns blog recently did a Clover sew along and had lots of useful information about fitting. I also read up a little in my sewing books and then whipped up a muslin. The best muslins, if you read into it, are made up in fabric that a similar consistency to the fabric you are going to use for the finished article. 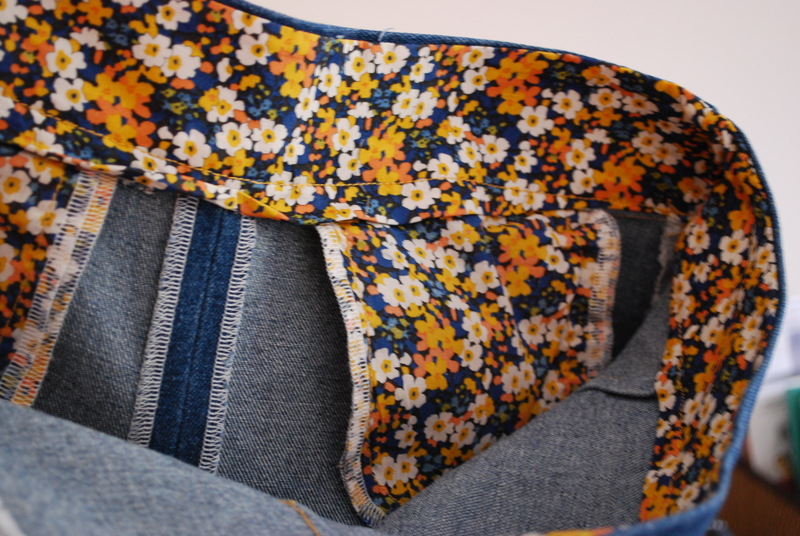 The Clover pattern calls for fabric with a little bit of stretch and the denim I planned to use had that. Unfortunately that was the only fabric that I had that did have any stretch (other than some very stretchy jersey) which therefore meant that the muslin I made wasn’t entirely helpful. But, time being precious at the moment, I decided to plough on. The muslin had at least confirmed that the crotch length was fine so I cut out the pieces in the denim fabric and basted them all together to check the fit more accurately. The only adjustment I ended up making was to take some width off the back leg pieces from the hip to the back of the knee. If I had worked this out on the muslin I would have sliced the pattern piece in the middle and taken the width out of the centre but as it was I just took in the inner leg side seam and a little on the outer leg side seam and to be honest that seemed to work fine. (Please excuse the brush and my efforts at cleaning up in the corner of the photo). 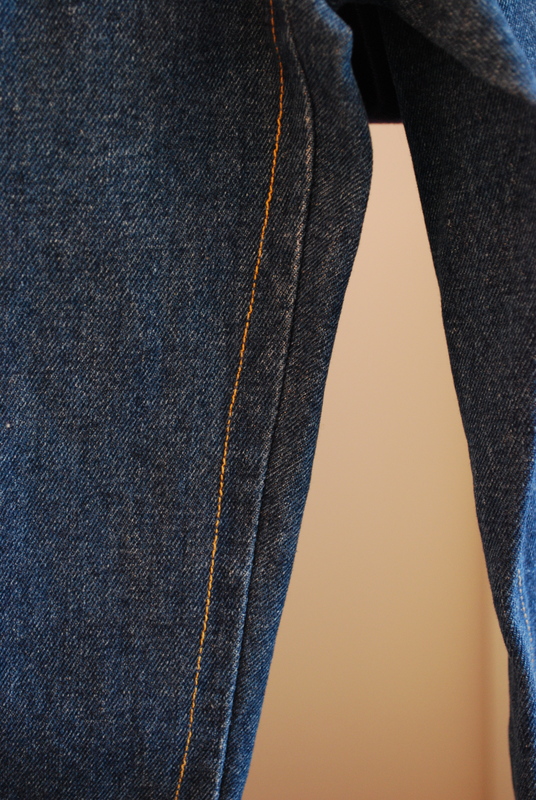 As the denim was relatively thick I decided to use a thinner fabric for the inner waistband and the pockets – recognise it? The pockets fit into the lower part of the front waistband giving a lovely clean line with no bunching at the side seams. Hmmm, I thought you might ask. Take a look at this You see the seam on the right and to the left what might at first instance appear like top stitching. But, it is much cleverer than that you see that is a mock flat felled seam. Smart and professional looking on the outside and oh so clean and tidy on the inside. I could lyric on about these seams but I suspect that would be very boring for anyone reading and so instead for those of you who might be interested I will just say that for more information and very good instruction on “how to” click here. 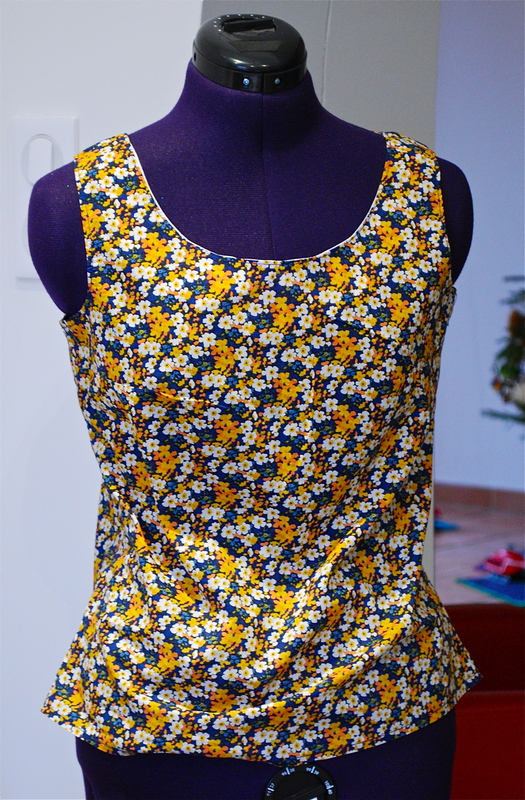 (No surprises for guessing that the tutorial I have linked to is on the Colette Patterns blog). Well, I think that is all I have to say. All in all I love these trousers and have already worn them several times. They totally achieve the aim of being casual but just a bit different to ordinary jeans and I am already planning several other pairs. 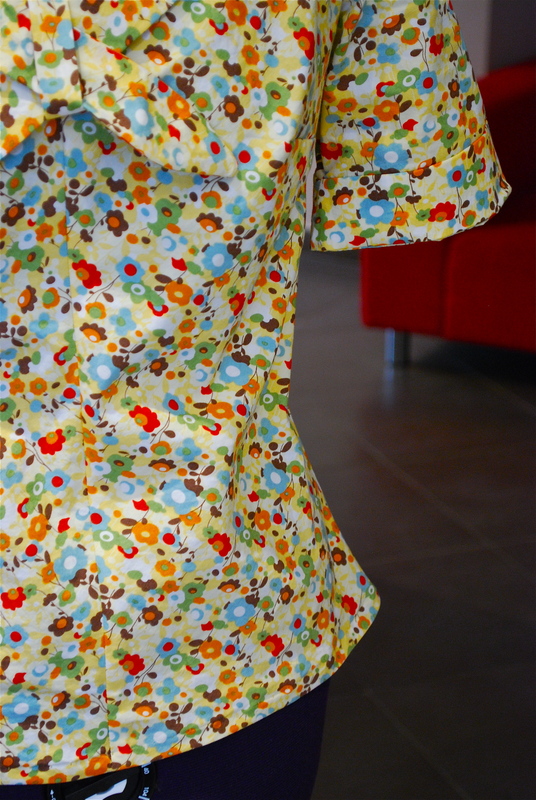 For the second garment I decided to stay with florals and tops. 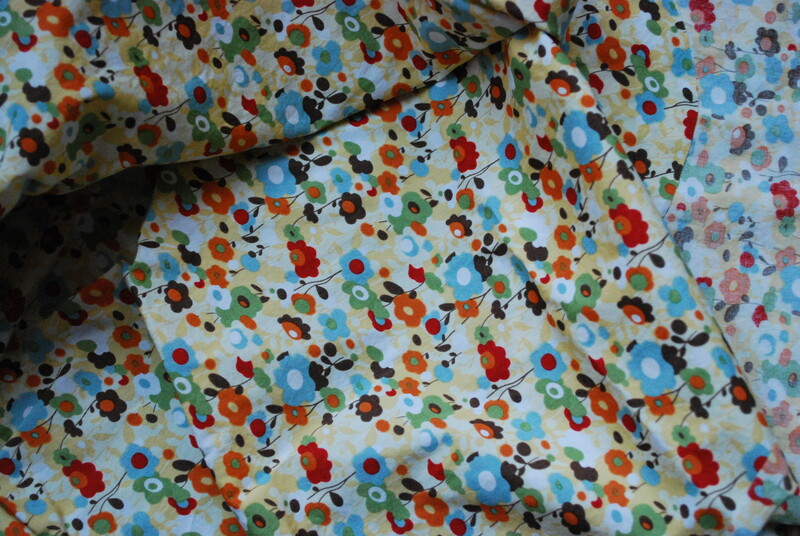 I had bought the Jasmine pattern from Colette Patterns a couple of months ago and thought I would give it a try in the retro floral cotton lawn fabric that I had bought from this seller on ebay. The Jasmine pattern is, as you might be able to see from the description on the pattern envelope above, a bias cut top. 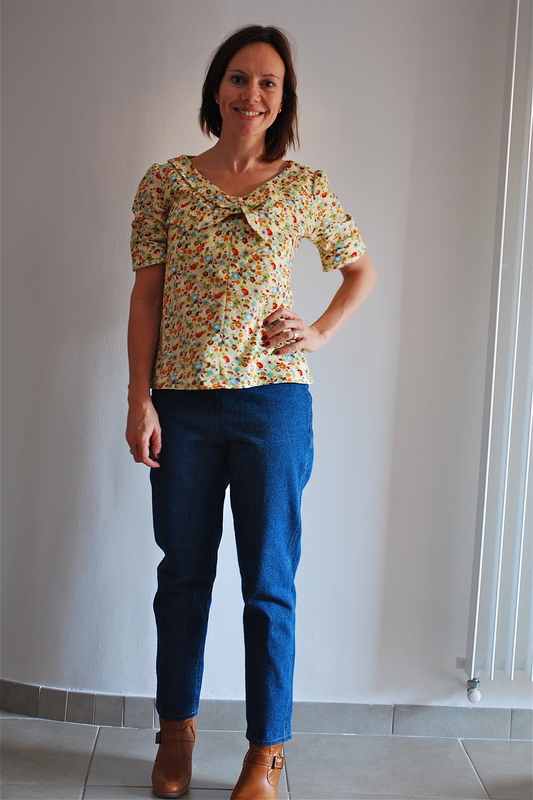 I had seen a couple of versions sewn up on the Colette Patterns Forums and was keen to see whether the top was as flattering on me as it seemed on to be others. 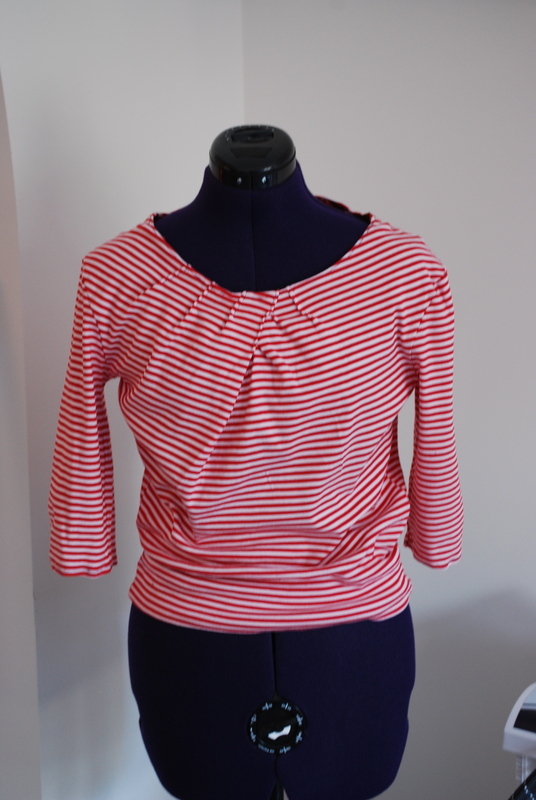 I made up version 2 of the top – with the shorter neck tie and cuffed sleeves. The pattern was a dream to piece together and the bias cut really does flatter the body – gently hugging the body in the right places but without being tight. 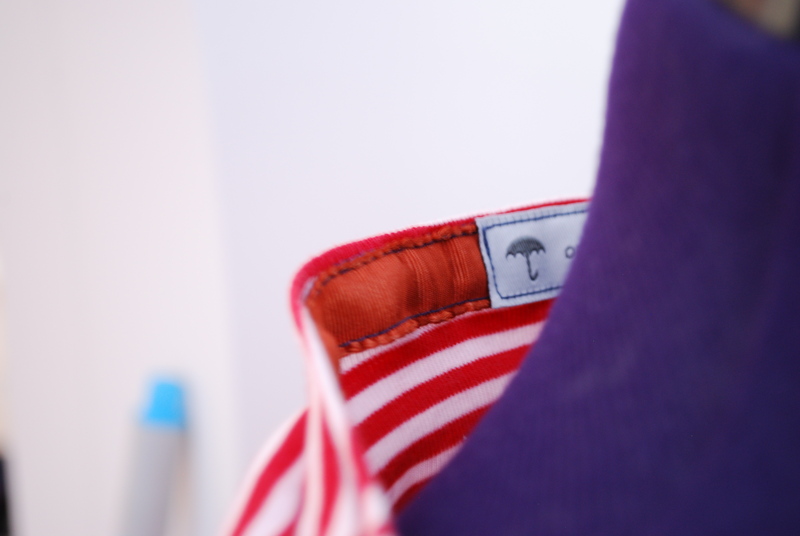 The bias cut also means that the top is easy to get on and off without having to sew nasty closures and without the top hanging off you once you have it on (in the way that some other garments that don’t have closures are – big in order to be able to get them on and off). The cut gently shows off the waist without pulling out over the hips and the sleeves and gently gathered at the top which gives a feminine silhouette. Last, but not least. The neck tie is the part that I love the best. The construction of it is so neat. 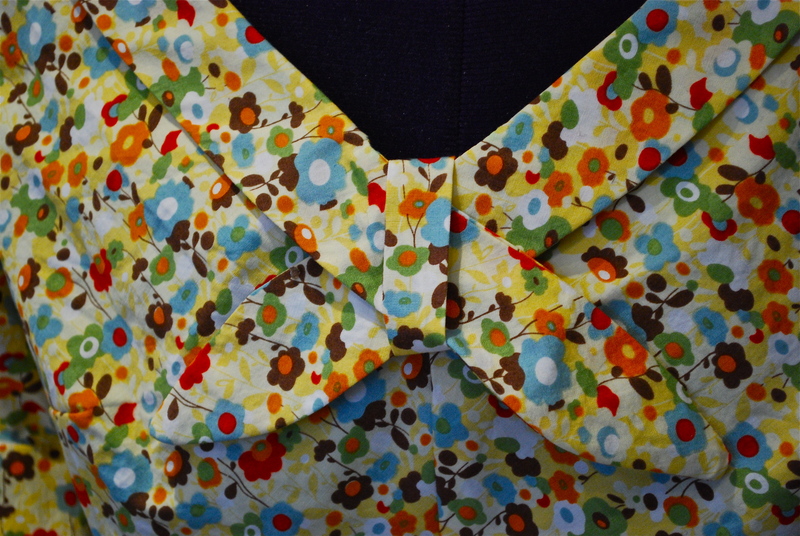 I can’t wait to make another with a contrasting neck tie to really make the most of it. I have already worn this top a few times and I’m sure it will become a firm favourite. Flattering and pretty and very very comfortable. As promised yesterday here is the post about the first item I made for my Late Fall Challenge. As I stated in that post (click here if you missed it) my mission was to make four or five items to mix and match to give me a handful of outfits that suit my lifestyle and the time of year. There has been quite a lot of talk recently on various sewing blogs about planning your sewing and about sewing things that you would actually wear day to day. And seeing as sewing is related to fashion and fashion is all about trends I thought I would cash in on this one! The planning part of sewing is something that seems completely obvious once you start thinking about it – but the problem is that until someone points it out many of us just don’t think about it. 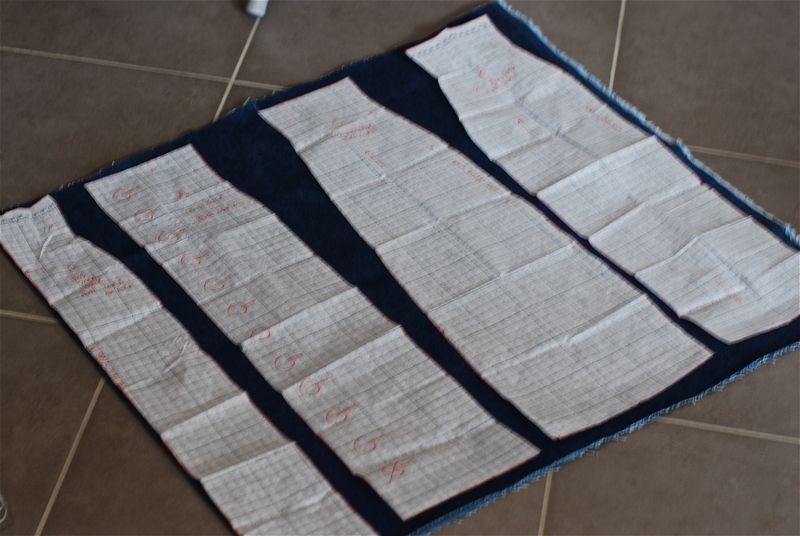 In some ways the extent to which you need to incorporate a ‘plan’ into your sewing depends largely on how prolific a sewer you are and whether your ultimate aim (in the long or short term) is to home-produce the majority of your wardrobe. 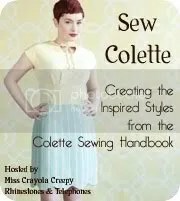 If you just like to sew the odd garment here and there then it is probably fine to pick and choose patterns and fabrics on the spur of the moment without too much thought as to what that garment will go with and how it will fit into your day to day wardrobe (much like spur of the moment purchases). If, on the other hand, you are aiming to sew most of your own clothes then some planning is essential to ensure that you end up with clothes that make up oufits that you actually wear. OK, well that was a fairly long winded way of saying that I had a plan for this challenge. Firstly, I wanted a few outfits that I could sling on in the morning without having to think too hard about what goes together well (hence the mix and match requirement). Secondly, having fairly recently given birth I wanted a bit of a change of style. Nothing too drastic but having spent the latter part of my pregnancy in elasticated waist bottoms and jersey tops I wanted to look a little smarter and I wanted an injection of colour to combat any winter blues. 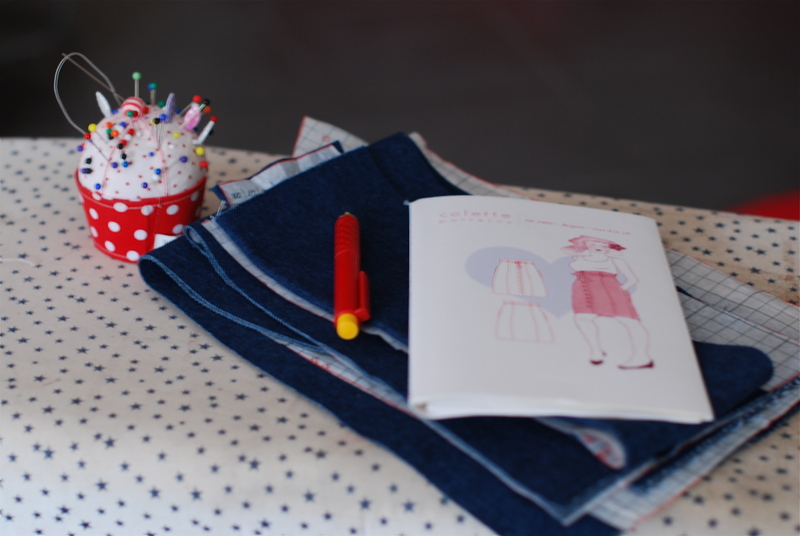 I decided that I would like to try and make one pair of trousers, a skirt and at least a couple of tops. For the trousers and skirt I decided to play relatively safe and go for a deep blue denim. 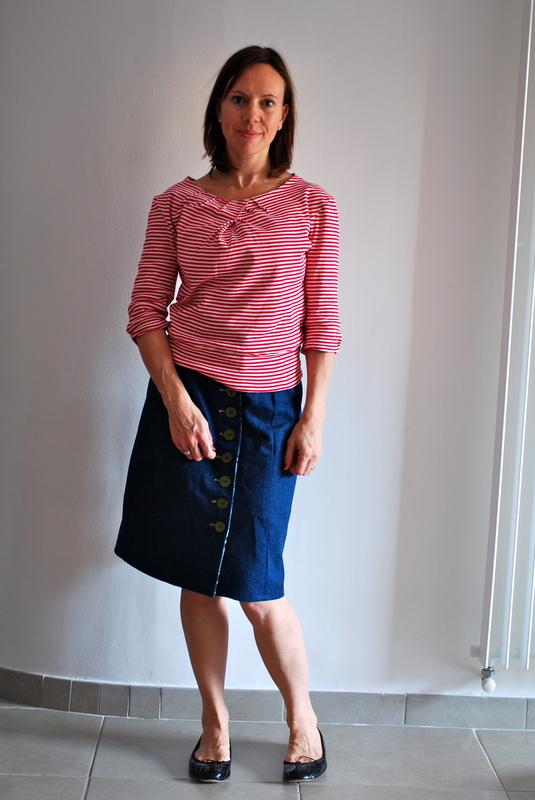 Not massively exciting but I have been after a denim skirt for a while now as I like the way they can be dressed up or down and as for the trousers I decided to try out the new Colette Patterns trouser pattern Clover as a slightly different take on a pair of jeans. Tops-wise I had a pretty yellow floral cotton and some red and white striped jersey left over from my red marinière. And, I also had this dress: This was a dress that I made at the beginning of the summer when I had a bump to dress. 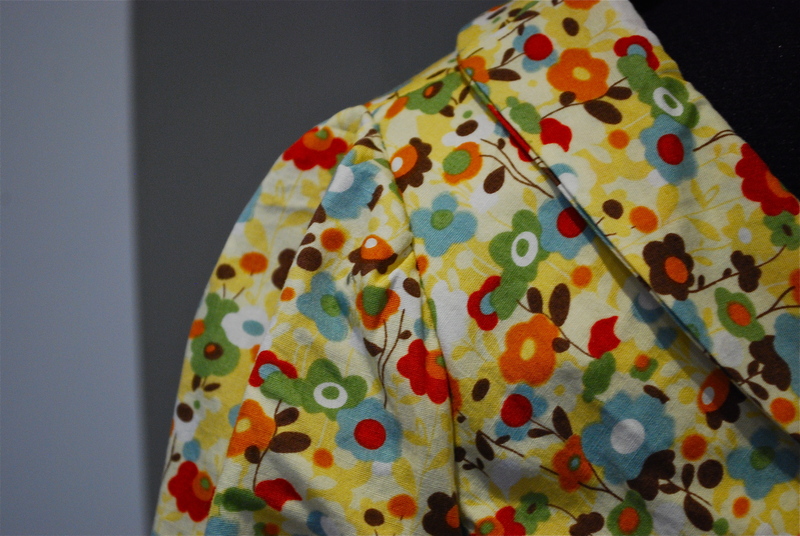 It had a navy blue jersey yoke and the floral cotton is a Liberty cotton lawn. I liked the dress but suspected that it would not be worn too much in the future as I generally have a fairly strong aversion to wearing anything I have worn whilst pregnant after I have given birth. I therefore decided to do a little recycling/upcycling. Given that I was limited in terms of the amount of fabric I pulled out the Colette Sobretto pattern. A simple tank top would be just perfect. I lengthened the pattern by about 5cm through the waist so that it fell slightly longer and I omitted the front pleat (mainly as I didn’t have enough fabric but I also think that the pleat looks best in a relatively plain fabric where you can use the pleat to best visual effect). Instead of using bias binding to finish the armholes and neck I overlocked the edges and used a thin hem on the armholes and drafted a front and back facing for the neckline. So there you have it. Item 1 of my late fall challenge. More coming up this week….